CPU History Museum for Intel CPUs, AMD Processor, Cyrix Microprocessors, Microcontrollers and more. Intel i3002 Test Systems<< NEW!! Fairchild developed the Clipper architecture in 1986, and sold it to Intergraph in 1987. 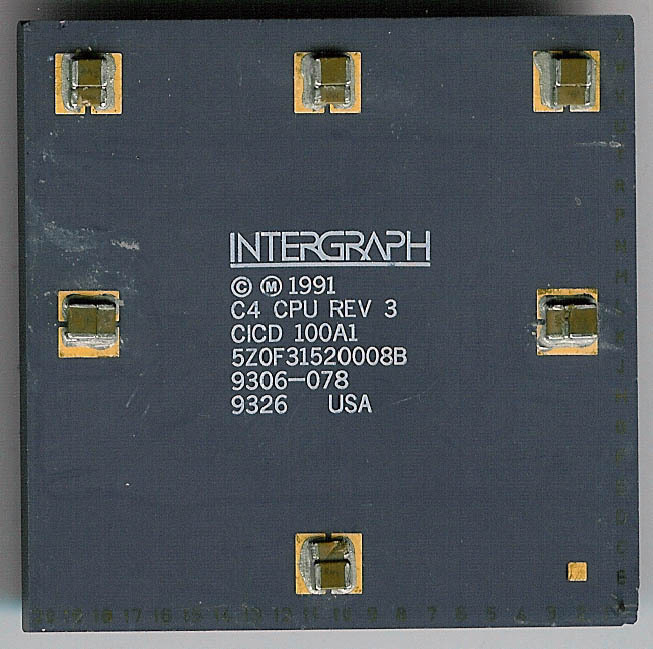 The design never enjoyed wide success and was only used in systems made by Integraph, as well as some by ‘High Level Hardware.’ The deign itself was RISC like and competed mainly with the Sun SPARC processors. The final version was the C400 which was released in 1993 (preceded by the C100 and C300). Presumably there was a C200 but I have not seen any documentation on it. The C400 ran at 50MHz (like the C300) and actually consisted of 3 separate chips. The CPU, the FPU and the CAMMU (Cache/Memory Management Unit). Intergraph developed their own version of UNIX called CLIX to run on the clipper, and demonstrated a version of Windows NT that ran on the C400 as well. Ultimately the lack of software support, and the slow adoption killed the Clipper. 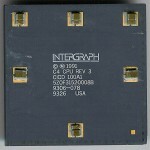 While Intergraph was designing the C5, Intel assured them a good supply of processors, and this convinced Intergraph to cancel the C5. 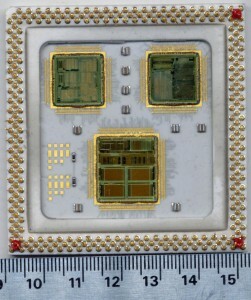 It was also available as a MCM (multi-chip-module) incorporating all three dies in a single ceramic package. This is one of the nicest looking MCMs I have seen, unfortunately the bottom plate was missing when I got it, but the dies are at least visible. I unfortunately am not sure which die is which so if you know, let me know. In my daily hunt for new processors, and other chips for the museum, as well as information about new chips, I constantly come across interesting chips, in strange locations. Here you will get a chance to learn WHERE many of the chips in the museum come from and what they are. They are sorted by manufacturer (technically brand) and thumbnails are now WORKING. Vintage Intel 88C196EC CPU die: Wafer was diced but dies were never packaged. 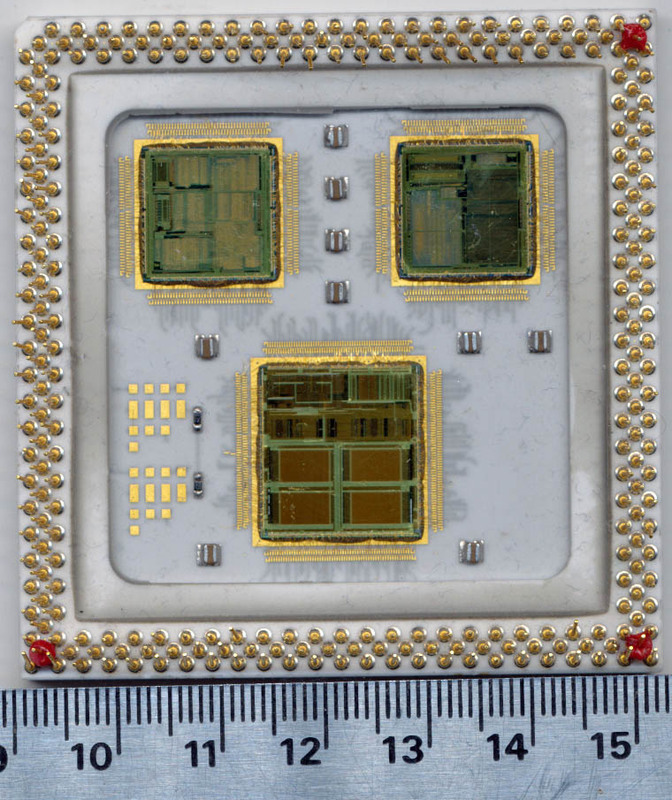 Vintage Intel 80486DX2 CPU die: Wafer was diced but dies were never packaged.